ASA has been committed to being a leader and innovator in aviation supplies and publications since 1947. We continually strive to bring the very best to our customers. The ASA philosophy is to surround ourselves with the best authors, software developers, product managers, and editors the world of aviation has to offer, and incorporate their experience and wisdom into the top quality products we provide. You can always count on ASA to be at the forefront of technology to bring you the best materials available. Today, we asked recently-certified remote pilot Monira B. to share his experience studying for and taking the FAA Remote Pilot Knowledge Test. I’ve been building and tinkering with drones for the last couple years and flying them recreationally. I wanted to get into aerial photography and figured I’d eventually sell prints or try to monetize it, so it made sense to get a remote pilot’s license. Based on what I read online, it’s better to be safe and get the license than not. I didn’t have any prior piloting experience so I was starting with zero knowledge and this was all new to me. Given I was starting from scratch and self-guiding myself through this process, I wanted to understand the test style (it’s also been over 10 years since I last took a test in college). I downloaded “Prepware Remote Pilot” and went through 10-15 random test questions to get a feel for the style of questions (I think I missed 90% of all these). 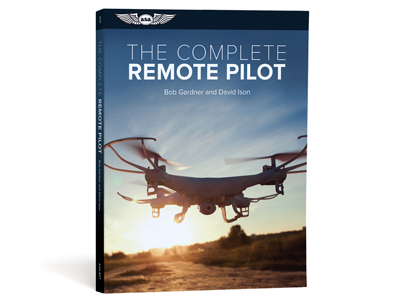 Next, I read through ASA’s Remote Pilot Test Prep as my main studying resource. It’s main appeal was the short chapter text and the easily consumable writing style. I read through the content in less than a week and took my first full test through the Prepware Remote Pilot app. I ended up getting 73%. I looked through all my missed questions and reviewed the correct answers with the explanation blurb. Through reviewing the questions, I noticed a trend that I was missing most questions in a few sections (Weather–TAF/METAR and Sectional Charts), so I doubled down studying in those areas and spent a few days really diving into those sections to make sure I understood the content. I repeated the test in the app and increased my score to the high 80s so I felt comfortable taking the actual FAA test. I would recommend taking practice tests until you feel comfortable and achieve a high score. I scored an 82% on the final test and passed on my first attempt. Schedule a test date in advance to force yourself to study. Use the app, since your phone is always with you. It’s easy to run through a handful of questions randomly throughout the day (especially since you’d probably just be surfing facebook anyway). 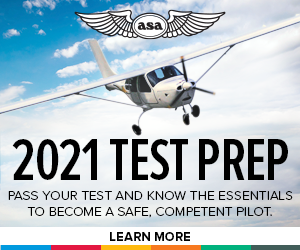 Check the updated test questions on the ASA website (they’re free) prior to taking the test. Notice the trends in certain areas, so you can spend your time studying other areas. For example, the Remote Pilot in Command is responsible for almost everything, so questions asking “who’s in charge when…” are easy to answer. Focus on studying what’s new to you. Eat something ahead of time. Once you’ve answered all the questions on the test, go back through and look it over before submitting. Today we’re taking a look at a concept related to high speed flight, shock waves, with an excerpt from the Pilot’s Handbook of Aeronautical Knowledge (FAA-H-8083-25B). During flight, a wing produces lift by accelerating the airflow over the upper surface. This accelerated air can, and does, reach sonic speeds even though the aircraft itself may be flying subsonic. At some extreme angles of attack (AOA), in some aircraft, the speed of the air over the top surface of the wing may be double the aircraft’s speed. It is therefore entirely possible to have both supersonic and subsonic airflow on an aircraft at the same time. When flow velocities reach sonic speeds at some location on an aircraft (such as the area of maximum camber on the wing), further acceleration results in the onset of compressibility effects, such as shock wave formation, drag increase, buffeting, stability, and control difficulties. Subsonic flow principles are invalid at all speeds above this point. 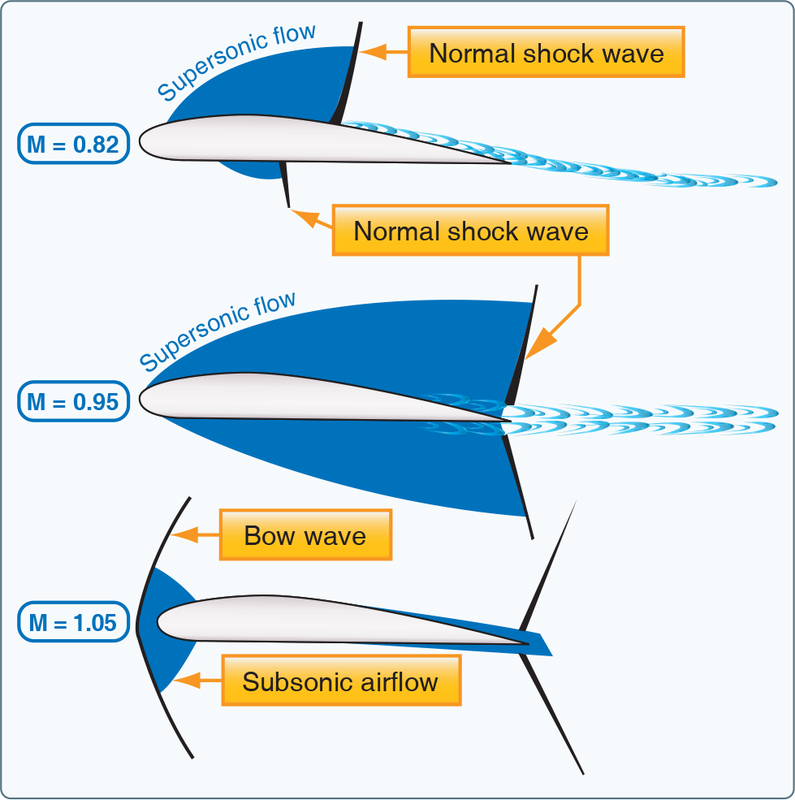 Normal shock waves form on the wing’s upper surface and form an additional area of supersonic flow and a normal shock wave on the lower surface. As flight speed approaches the speed of sound, the areas of supersonic flow enlarge and the shock waves move nearer the trailing edge. Associated with “drag rise” are buffet (known as Mach buffet), trim, and stability changes and a decrease in control force effectiveness. The loss of lift due to airflow separation results in a loss of downwash and a change in the position of the center pressure on the wing. Airflow separation produces a turbulent wake behind the wing, which causes the tail surfaces to buffet (vibrate). The nose-up and nose-down pitch control provided by the horizontal tail is dependent on the downwash behind the wing. Thus, an increase in downwash decreases the horizontal tail’s pitch control effectiveness since it effectively increases the AOA that the tail surface is seeing. Movement of the wing center of pressure (CP) affects the wing pitching moment. If the CP moves aft, a diving moment referred to as “Mach tuck” or “tuck under” is produced, and if it moves forward, a nose-up moment is produced. This is the primary reason for the development of the T-tail configuration on many turbine-powered aircraft, which places the horizontal stabilizer as far as practical from the turbulence of the wings. Today, we’re featuring an excerpt from the Pilot’s Handbook of Aeronautical Knowledge (FAA-8083-25B). Engine-driven alternators or generators supply electric current to the electrical system. They also maintain a sufficient electrical charge in the battery. Electrical energy stored in a battery provides a source of electrical power for starting the engine and a limited supply of electrical power for use in the event the alternator or generator fails. Most DC generators do not produce a sufficient amount of electrical current at low engine rpm to operate the entire electrical system. 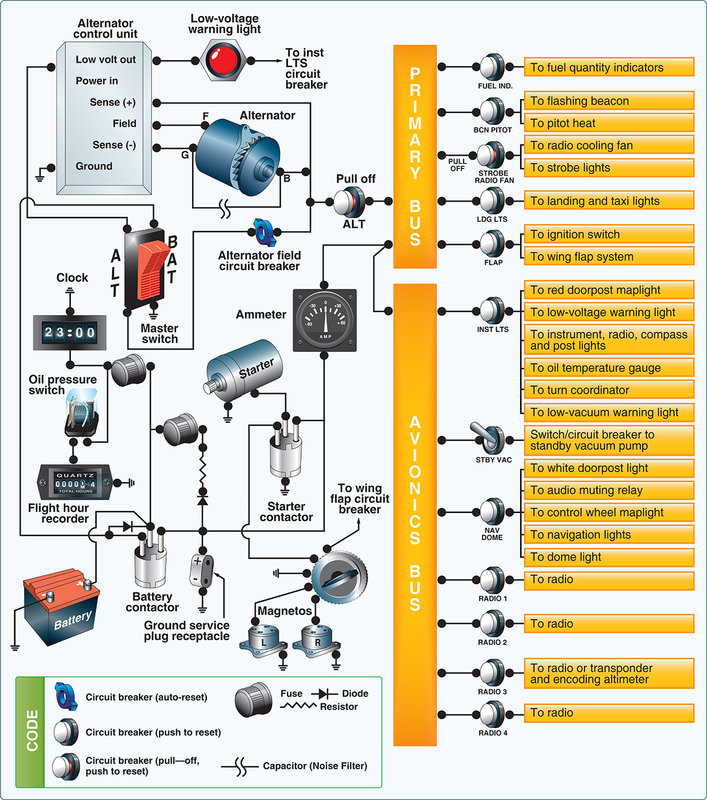 During operations at low engine rpm, the electrical needs must be drawn from the battery, which can quickly be depleted. Alternators have several advantages over generators. Alternators produce sufficient current to operate the entire electrical system, even at slower engine speeds, by producing alternating current (AC), which is converted to DC. The electrical output of an alternator is more constant throughout a wide range of engine speeds. Many aircraft are equipped with a battery switch that controls the electrical power to the aircraft in a manner similar to the master switch. In addition, an alternator switch is installed that permits the pilot to exclude the alternator from the electrical system in the event of alternator failure. On this master switch, the left half is for the alternator and the right half is for the battery. With the alternator half of the switch in the OFF position, the entire electrical load is placed on the battery. All nonessential electrical equipment should be turned off to conserve battery power. A bus bar is used as a terminal in the aircraft electrical system to connect the main electrical system to the equipment using electricity as a source of power. This simplifies the wiring system and provides a common point from which voltage can be distributed throughout the system. Fuses or circuit breakers are used in the electrical system to protect the circuits and equipment from electrical overload. Spare fuses of the proper amperage limit should be carried in the aircraft to replace defective or blown fuses. Circuit breakers have the same function as a fuse but can be manually reset, rather than replaced, if an overload condition occurs in the electrical system. Placards at the fuse or circuit breaker panel identify the circuit by name and show the amperage limit. An ammeter is used to monitor the performance of the aircraft electrical system. The ammeter shows if the alternator/generator is producing an adequate supply of electrical power. It also indicates whether or not the battery is receiving an electrical charge. Ammeters are designed with the zero point in the center of the face and a negative or positive indication on either side. When the pointer of the ammeter is on the plus side, it shows the charging rate of the battery. A minus indication means more current is being drawn from the battery than is being replaced. A full-scale minus deflection indicates a malfunction of the alternator/generator. 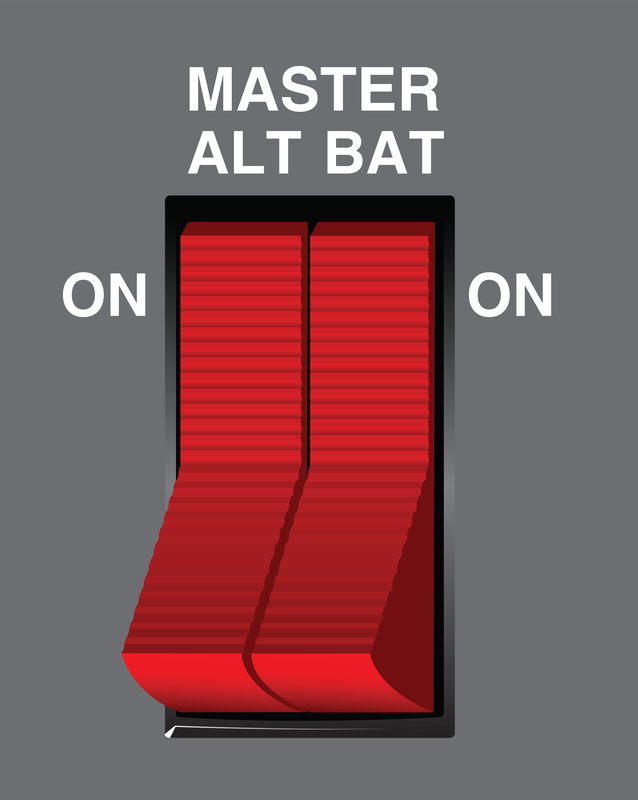 A full-scale positive deflection indicates a malfunction of the regulator. In either case, consult the AFM/POH for appropriate action to be taken. Not all aircraft are equipped with an ammeter. Some have a warning light that, when lighted, indicates a discharge in the system as a generator/alternator malfunction. Refer to the AFM/POH for appropriate action to be taken. Another electrical monitoring indicator is a loadmeter. This type of gauge has a scale beginning with zero and shows the load being placed on the alternator/generator. The loadmeter reflects the total percentage of the load placed on the generating capacity of the electrical system by the electrical accessories and battery. When all electrical components are turned off, it reflects only the amount of charging current demanded by the battery. A voltage regulator controls the rate of charge to the battery by stabilizing the generator or alternator electrical output. The generator/alternator voltage output should be higher than the battery voltage. For example, a 12-volt battery would be fed by a generator/alternator system of approximately 14 volts. The difference in voltage keeps the battery charged. Very first thing, though is you should create the book. Today we’ll review one of the fundamental concepts in aviation weather, understanding clouds. This post feature’s an excerpt from the Pilot’s Handbook of Aeronautical Knowledge (8083-25B). Cloud type is determined by its height, shape, and characteristics. They are classified according to the height of their bases as low, middle, or high clouds, as well as clouds with vertical development. Low clouds are those that form near the Earth’s surface and extend up to about 6,500 feet AGL. They are made primarily of water droplets but can include supercooled water droplets that induce hazardous aircraft icing. Typical low clouds are stratus, stratocumulus, and nimbostratus. Fog is also classified as a type of low cloud formation. Clouds in this family create low ceilings, hamper visibility, and can change rapidly. Because of this, they influence flight planning and can make visual flight rules (VFR) flight impossible. 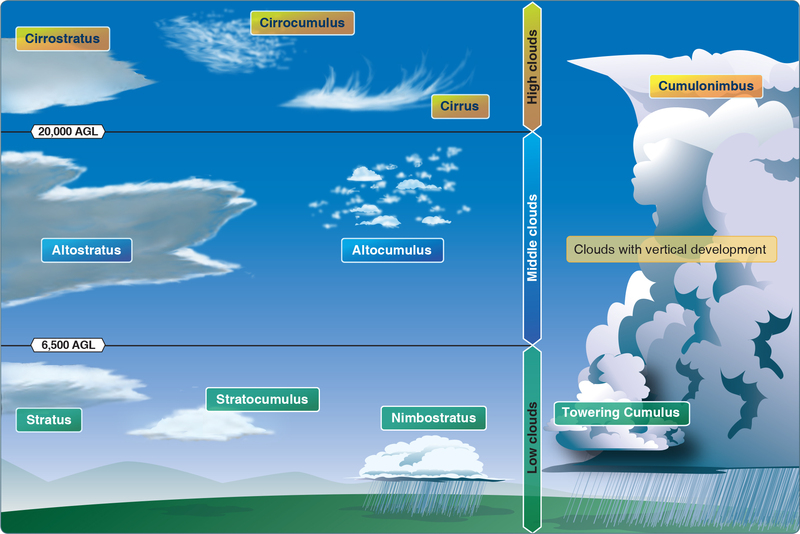 Clouds with extensive vertical development are cumulus clouds that build vertically into towering cumulus or cumulonimbus clouds. The bases of these clouds form in the low to middle cloud base region but can extend into high altitude cloud levels. Towering cumulus clouds indicate areas of instability in the atmosphere, and the air around and inside them is turbulent. These types of clouds often develop into cumulonimbus clouds or thunderstorms. Cumulonimbus clouds contain large amounts of moisture and unstable air and usually produce hazardous weather phenomena, such as lightning, hail, tornadoes, gusty winds, and wind shear. These extensive vertical clouds can be obscured by other cloud formations and are not always visible from the ground or while in flight. When this happens, these clouds are said to be embedded, hence the term, embedded thunderstorms. To pilots, the cumulonimbus cloud is perhaps the most dangerous cloud type. It appears individually or in groups and is known as either an air mass or orographic thunderstorm. Heating of the air near the Earth’s surface creates an air mass thunderstorm; the upslope motion of air in the mountainous regions causes orographic thunderstorms. Cumulonimbus clouds that form in a continuous line are nonfrontal bands of thunderstorms or squall lines. Since rising air currents cause cumulonimbus clouds, they are extremely turbulent and pose a significant hazard to flight safety. For example, if an aircraft enters a thunderstorm, the aircraft could experience updrafts and downdrafts that exceed 3,000 fpm. In addition, thunderstorms can produce large hailstones, damaging lightning, tornadoes, and large quantities of water, all of which are potentially hazardous to aircraft. Cloud classification can be further broken down into specific cloud types according to the outward appearance and cloud composition. Knowing these terms can help a pilot identify visible clouds. Today we’re featuring a follow-up to our recent post on the rectangular course with an excerpt from the Airplane Flying Handbook (FAA-H-8083-3B). Maintaining a specific relationship between the airplane and the ground. Dividing attention between the flightpath, groundbased references, manipulating of the flight controls, and scanning for outside hazards and instrument indications. Adjusting the bank angle during turns to correct for groundspeed changes in order to maintain a constant radius turn; steeper bank angles for higher ground speeds, shallow bank angles for slower groundspeeds. Improving competency in managing the quickly changing bank angles. Establishing and adjusting the wind correction angle in order to maintain the track over the ground. Developing the ability to compensate for drift in quickly changing orientations. Developing further awareness that the radius of a turn is correlated to the bank angle. 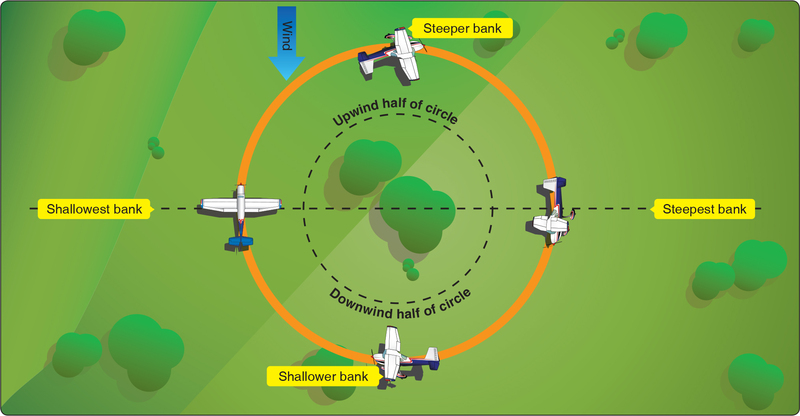 To perform a turn around a point, the pilot must complete at least one 360° turn; however, to properly assess wind direction, velocity, bank required, and other factors related to turns in wind, the pilot should complete two or more turns. 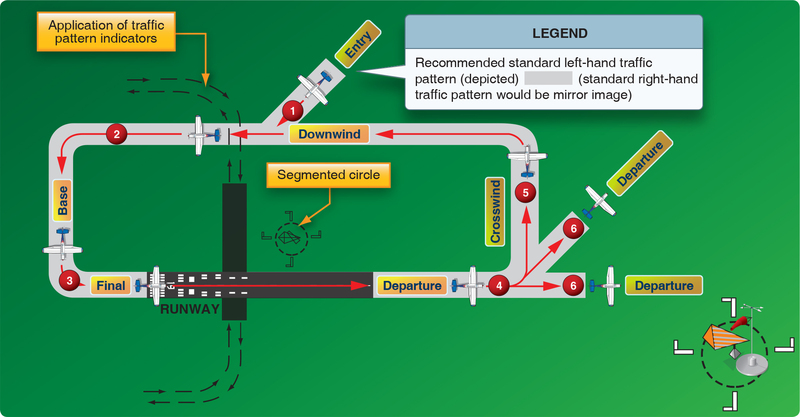 As in other ground reference maneuvers, when wind is present, the pilot must a constantly adjust the airplane’s bank and wind correction angle to maintain a constant radius turn around a point. In contrast to the ground reference maneuvers discussed previously in which turns were approximately limited to either 90° or 180°, turns around a point are consecutive 360° turns where, throughout the maneuver, the pilot must constantly adjust the bank angle and the resulting rate of turn in proportion to the groundspeed as the airplane sequences through the various wind directions. The pilot should make these adjustments by applying coordinated aileron and rudder pressure throughout the turn. When performing a turn around a point, the pilot should select a prominent, ground-based reference that is easily distinguishable yet small enough to present a precise reference. The pilot should enter the maneuver downwind, where the groundspeed is at its fastest, at the appropriate radius of turn and distance from the selected ground-based reference point. In a high-wing airplane, the lowered wing may block the view of the ground reference point, especially in airplanes with side-by-side seating during a left turn (assuming that the pilot is flying from the left seat). To prevent this, the pilot may need to change the maneuvering altitude or the desired turn radius. The pilot should ensure that the reference point is visible at all times throughout the maneuver, even with the wing lowered in a bank. Upon entering the maneuver, depending on the wind’s speed, it may be necessary to roll into the initial bank at a rapid rate so that the steepest bank is set quickly to prevent the airplane from drifting outside of the desired turn radius. This is best accomplished by repeated practice and assessing the required roll in rate. Thereafter, the pilot should gradually decrease the angle of bank until the airplane is headed directly upwind. As the upwind becomes a crosswind and then a downwind, the pilot should gradually steepen the bank to the steepest angle upon reaching the initial point of entry. During the downwind half of the turn, the pilot should progressively adjust the airplane’s heading toward the inside of the turn. During the upwind half, the pilot should progressively adjust the airplane’s heading toward the outside of the turn. Recall from the previous discussion on wind correction angle that the airplane’s heading should be ahead of its position over the ground during the downwind half of the turn behind its position during the upwind half. Remember that the goal is to make a constant radius turn over the ground and, because the airplane is flying through a moving air mass, the pilot must constantly adjust the bank angle to achieve this goal. Failure to adequately clear the area above, below, and on either side of the airplane for safety hazards, initially and throughout the maneuver. Failure to establish a constant, level altitude prior to entering the maneuver. Failure to maintain altitude during the maneuver. Failure to properly assess wind direction. Failure to properly execute constant radius turns. Failure to manipulate the flight controls in a smooth and continuous manner. Failure to establish the appropriate wind correction angle. Failure to apply coordinated aileron and rudder pressure, resulting in slips or skids. Today we’re featuring an excerpt from the Pilot’s Handbook of Aeronautical Knowledge (FAA-H-8083-25B). At airports without an operating control tower, a segmented circle visual indicator system, if installed, is designed to provide traffic pattern information. 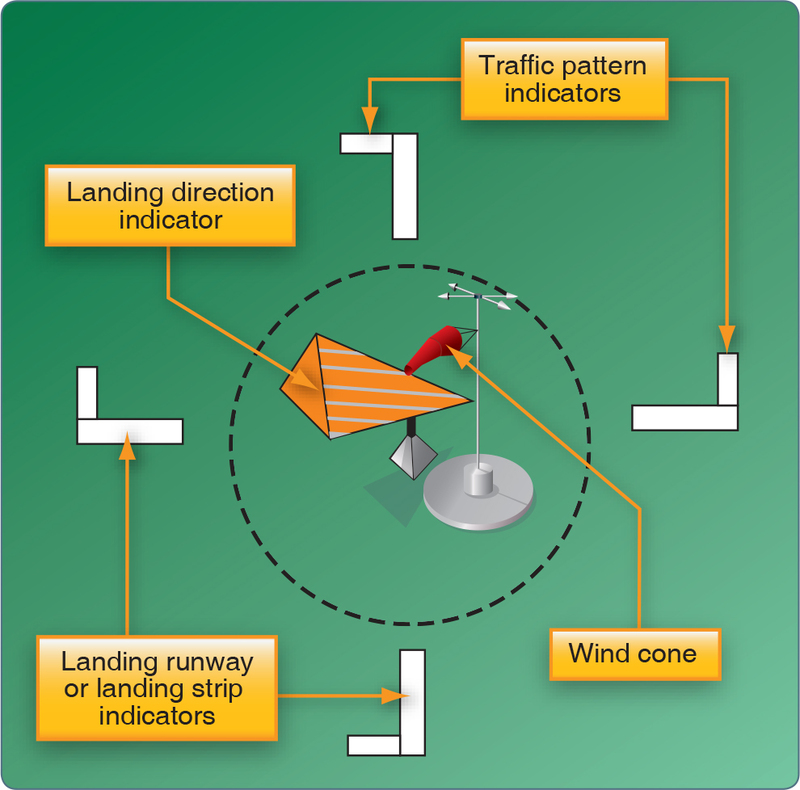 Usually located in a position affording maximum visibility to pilots in the air and on the ground and providing a centralized location for other elements of the system, the segmented circle consists of the following components: wind direction indicators, landing direction indicators, landing strip indicators, and traffic pattern indicators. At most airports and military air bases, traffic pattern altitudes for propeller-driven aircraft generally extend from 600 feet to as high as 1,500 feet above ground level (AGL). Pilots can obtain the traffic pattern altitude for an airport from the Chart Supplement U.S. Also, traffic pattern altitudes for military turbojet aircraft sometimes extend up to 2,500 feet AGL. Therefore, pilots of en route aircraft should be constantly on alert for other aircraft in traffic patterns and avoid these areas whenever possible. When operating at an airport, traffic pattern altitudes should be maintained unless otherwise required by the applicable distance from cloud criteria according to 14 CFR §91.155. Additional information on airport traffic pattern operations can be found in Chapter 4, “Air Traffic Control,” of the AIM. Pilots can find traffic pattern information and restrictions, such as noise abatement in the Chart Supplement U.S. Complete turn to final at least ¼ mile from the runway. After takeoff or go-around, continue straight ahead until beyond departure end of runway. 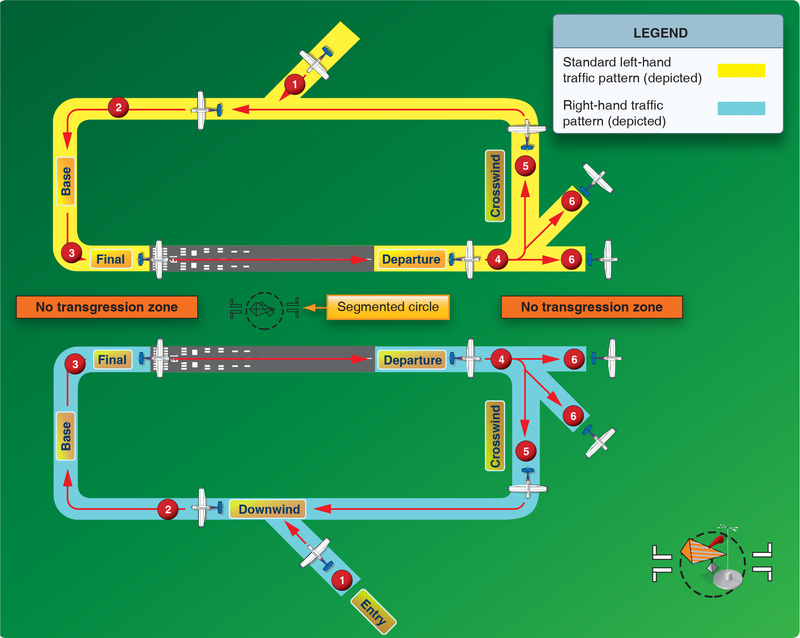 If departing the traffic pattern, continue straight out, or exit with a 45° turn (to the left when in a left-hand traffic pattern; to the right when in a right-hand traffic pattern) beyond the departure end of the runway, after reaching pattern altitude. Do not continue on a track that penetrates the departure path of the parallel runway. Today, we’ll introduce one of the aerodynamic fundamentals of helicopter flight, hovering, with an excerpt from the Helicopter Flying Handbook (FAA-H-8083-21A). Hovering is the most challenging part of flying a helicopter. This is because a helicopter generates its own gusty air while in a hover, which acts against the fuselage and flight control surfaces. The end result is constant control inputs and corrections by the pilot to keep the helicopter where it is required to be. Despite the complexity of the task, the control inputs in a hover are simple. The cyclic is used to eliminate drift in the horizontal plane, controlling forward, backward, right and left movement or travel. The throttle, if not governor controlled, is used to control revolutions per minute (rpm). The collective is used to maintain altitude. The pedals are used to control nose direction or heading. It is the interaction of these controls that makes hovering difficult, since an adjustment in any one control requires an adjustment of the other two, creating a cycle of constant correction. During hovering flight, a helicopter maintains a constant position over a selected point, usually a few feet above the ground. The ability of the helicopter to hover comes from the both the lift component, which is the force developed by the main rotor(s) to overcome gravity and aircraft weight, and the thrust component, which acts horizontally to accelerate or decelerate the helicopter in the desired direction. 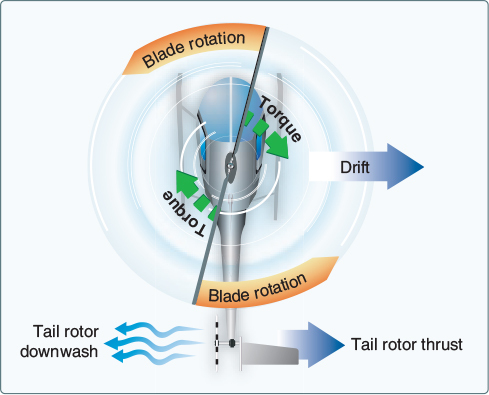 Pilots direct the thrust of the rotor system by using the cyclic to change the tip-path plane as compared to the visible horizon to induce travel or compensate for the wind and hold a position. At a hover in a no-wind condition, all opposing forces (lift, thrust, drag, and weight) are in balance; they are equal and opposite. Therefore, lift and weight are equal, resulting in the helicopter remaining at a stationary hover. To maintain a hover at a constant altitude, the lift must equal the weight of the helicopter. Thrust must equal any wind and tail rotor thrust to maintain position. The power must be sufficient to turn the rotors and overcome the various drags and frictions involved. While hovering, the amount of main rotor thrust can be changed to maintain the desired hovering altitude. This is done by changing the angle of incidence (by moving the collective) of the rotor blades and hence the angle of attack (AOA) of the main rotor blades. Changing the AOA changes the drag on the rotor blades, and the power delivered by the engine must change as well to keep the rotor speed constant. The weight that must be supported is the total weight of the helicopter and its occupants. 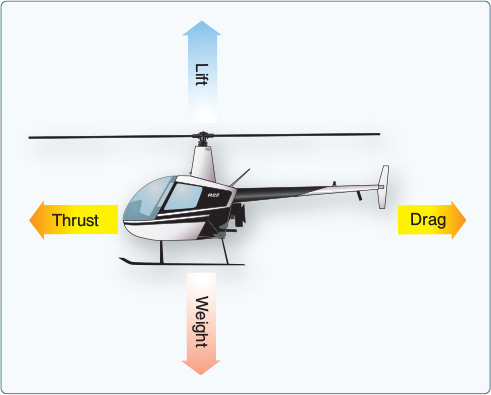 If the amount of lift is greater than the actual weight, the helicopter accelerates upwards until the lift force equals the weight gain altitude; if thrust is less than weight, the helicopter accelerates downward. When operating near the ground, the effects of the proximity to the surface change this response. The drag of a hovering helicopter is mainly induced drag incurred while the blades are producing lift. There is, however, some profile drag on the blades as they rotate through the air and a small amount of parasite drag from the non-lift-producing surfaces of the helicopter, such as the rotor hub, cowlings, and landing gear. Throughout the rest of this discussion, the term “drag” includes induced, profile and parasite drag. An important consequence of producing thrust is torque. Remember Newton’s Third Law: for every action there is an equal and opposite reaction. Therefore, as the engine turns the main rotor system in a counterclockwise direction, the helicopter fuselage wants to turn clockwise. The amount of torque is directly related to the amount of engine power being used to turn the main rotor system. Remember, as power changes, torque changes. To counteract this torque-induced turning tendency, an antitorque rotor or tail rotor is incorporated into most helicopter designs. A pilot can vary the amount of thrust produced by the tail rotor in relation to the amount of torque produced by the engine. As the engine supplies more power to the main rotor, the tail rotor must produce more thrust to overcome the increased torque effect. This control change is accomplished through the use of antitorque pedals. Aircraft are flown at high altitudes for two reasons. First, an aircraft flown at high altitude consumes less fuel for a given airspeed than it does for the same speed at a lower altitude because the aircraft is more efficient at a high altitude. Second, bad weather and turbulence may be avoided by flying in relatively smooth air above the storms. Many modern aircraft are being designed to operate at high altitudes, taking advantage of that environment. In order to fly at higher altitudes, the aircraft must be pressurized or suitable supplemental oxygen must be provided for each occupant. It is important for pilots who fly these aircraft to be familiar with the basic operating principles, which we’ll talk about today with an excerpt from the Pilot’s Handbook of Aeronautical Knowledge (FAA-H-8083-25B). In a typical pressurization system, the cabin, flight compartment, and baggage compartments are incorporated into a sealed unit capable of containing air under a pressure higher than outside atmospheric pressure. 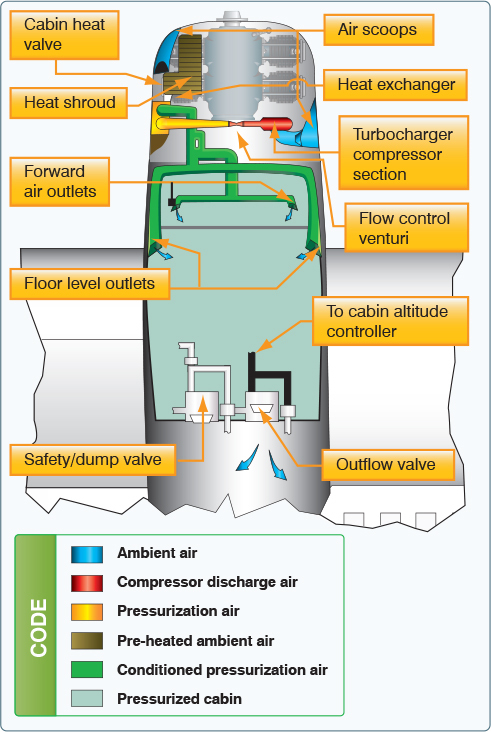 On aircraft powered by turbine engines, bleed air from the engine compressor section is used to pressurize the cabin. Superchargers may be used on older model turbine-powered aircraft to pump air into the sealed fuselage. Piston-powered aircraft may use air supplied from each engine turbocharger through a sonic venturi (flow limiter). Air is released from the fuselage by a device called an outflow valve. By regulating the air exit, the outflow valve allows for a constant inflow of air to the pressurized area. High performance airplane pressurization system. 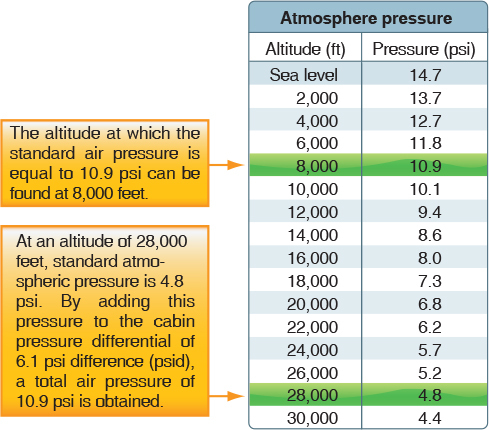 A cabin pressurization system typically maintains a cabin pressure altitude of approximately 8,000 feet at the maximum designed cruising altitude of an aircraft. This prevents rapid changes of cabin altitude that may be uncomfortable or cause injury to passengers and crew. In addition, the pressurization system permits a reasonably fast exchange of air from the inside to the outside of the cabin. This is necessary to eliminate odors and to remove stale air. Several instruments are used in conjunction with the pressurization controller. The cabin differential pressure gauge indicates the difference between inside and outside pressure. This gauge should be monitored to assure that the cabin does not exceed the maximum allowable differential pressure. A cabin altimeter is also provided as a check on the performance of the system. In some cases, these two instruments are combined into one. A third instrument indicates the cabin rate of climb or descent. A cabin rate-of-climb instrument and a cabin altimeter are illustrated in the figure below.